The chicken stock was actually a by-product of my Sunday lunch. For that I had to boil a chicken carcass (legs and wings removed) in water with a few stock cubes, thyme and half a bulb of garlic. I refrigerated the stock overnight Sunday and used it for the soup on Monday which saved time on Monday night and also allowed me to scoop all the solidified fat off the top before making my soup. I put the chicken carcass – minus the breasts which we ate the night before – and the separated legs and wings into the stock and brought it all to a boil. I simmered it for about 20-25 minutes until the legs were cooked. Then I strained it all into a clean pot and set the chicken aside to remove the skin and strip the meat from the bone. I brought the stock back to the boil and added thinly sliced carrots. After about 5-8 minutes I added the pasta. As I couldn’t find any suitably thick noodles, I used lasagna sheets and just broke them up as I put them into the stock so they were all different shapes and sizes, but it worked. When the pasta was nearly cooked I threw in some green beans which I had cut into bite-size pieces and the chicken. After a few more minutes it was done! That’s the joy of doing the time-consuming part the night before – who knew homemade chicken noodle soup could be a quick weeknight meal? After the obligatory sprinkling of parsley, it was ready to eat. It was so comforting, like having a hug from your grandma. 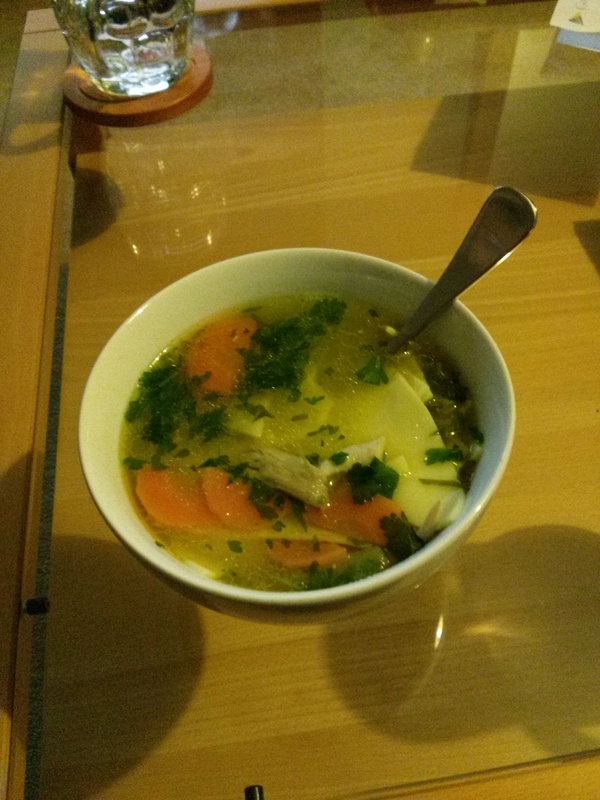 As my grandma lives a few thousand miles away, I can’t know what she would have thought of my version of her soup – and I don’t get nearly as many hugs as I should! – but I think she would have approved.